This Amish Beef and Noodles recipe can be made in a slow cooker or an Instant Pot. Served over mashed potatoes, it’s an easy and loved dinner recipe! Any Midwestern kid is well familiar with this Amish Beef and Noodles. Our school lunches would occasionally have this dish (but chicken flavored) and it was always one of my favorites to see on the menu – a creamy sauce with chunks of chicken, noodles, gravy, all served over an ice cream scoop of mashed potatoes. It was absolute heaven. I grew up not far from Amish county- I had friends in high school that lived around there, so in the 20 minute jaunt over to their house, it wasn’t uncommon to slow down because you got stuck behind a horse and buggy. So I guess I can’t say for certain that this is truly Amish style, but I can tell you with 100% certainty that is “Midwest style,” which more often than not means “comfort food.” Good, hearty, homestyle food that sticks to your ribs when you eat it, and warms you from the inside out, body and soul. I bet you didn’t know that someone could talk about a dish so passionately, did you? So somehow my memory of this dish got jogged last week. I think I was researching ideas of what to call another recipe of mine and was googling to see what to name it, and I ran across a similar concept in the results. As soon as I was reminded of it, I had a hankering that I knew had no chance of going away. 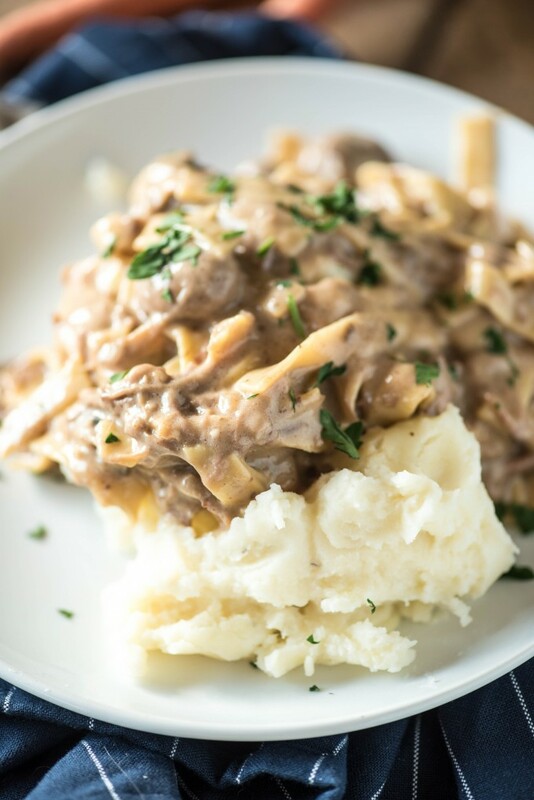 I decided to adapt the memory into this Amish Style Beef and Noodles with mashed potatoes, using a nice chuck roast instead of chicken, and doing the whole thing in a slow cooker for added ease, using just basic pantry ingredients. I always like to come up with new recipes to keep in my “default wheelhouse:” recipes that I can throw together because I already have everything I need to make it. 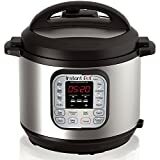 The whole thing was able to be cooked in my multi cooker- I browned the beef, then switched it over to the slow cooker setting for several hours on LOW to shred the beef. For the last hour, I stirred in the uncooked noodles, so they could cook in the broth and take on the flavor of the heavenly broth that was produced after 6 hours of slow cooking in a bath of flavor-makers. I think this recipe could be very easily adapted for the Instant Pot. While I just got mine, so I’m a bit of a novice, I would say that you could brown the meat on the “sauté” setting, then switch to “Meat” for 40 minutes, 10 minute natural release, then quick release. Add your noodles and return to the “sauté” setting for 10 minutes, until the noodles are cooked through. Of course, you could also follow the recipe as written using the “slow cook” setting as well. Heat a skillet over high heat. Add 1 tablespoon olive oil. Season chuck roast with salt and pepper, then sear in the skillet for 3-4 minutes, until browned. Flip and repeat on the other side. If your slow cooker has a "Roast" or "Sauté" setting, you could use this. Place the roast in the slow cooker, and sprinkle with the onion soup mix and the au jus mix. Pour the consommé and cream of mushroom soup over top and briefly mix together. Add in the mushrooms. Finely shred the chuck roast in the broth. Stir in the uncooked egg noodles. Recover and cook on HIGH for 1 hour. Pour in the cream and mix thoroughly. Scoop mashed potatoes onto a plate and top with a hearty helping of beef and noodles. Hi Tammy, I don’t know if it is diabetic friendly or not. I don’t know enough about the diebetic dietary requirements, you will probably just have to check out the ingredients. To help with the high carb issue use dreamworld pasta. I am a registered nurse and taught diabetes education. They can be found online. Sorry, no. To high in carbs. Leave off potatoes, eat other veggies, and the small serving of the main dish. Works for me. I’m diabetic. Use mashed cauliflower – very similar in texture and quite good. Not at all, not only are the noodles not healthy but add in the potatoes and it’s a nightmare. I just put this in my crockpot and can’t wait till it’s done. I’m thinking of adding some peas instead of noodles and serving it over masked potatoes or egg noodles. I just can’t see using both potatoes and noodles. We are having this tonight too! I promise the combo is amazing 🙂 Your way sounds great too though! 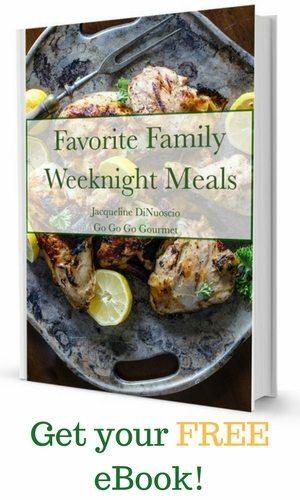 I have a husband coming home from the hospital so I need easy recipes to use. Thank you. 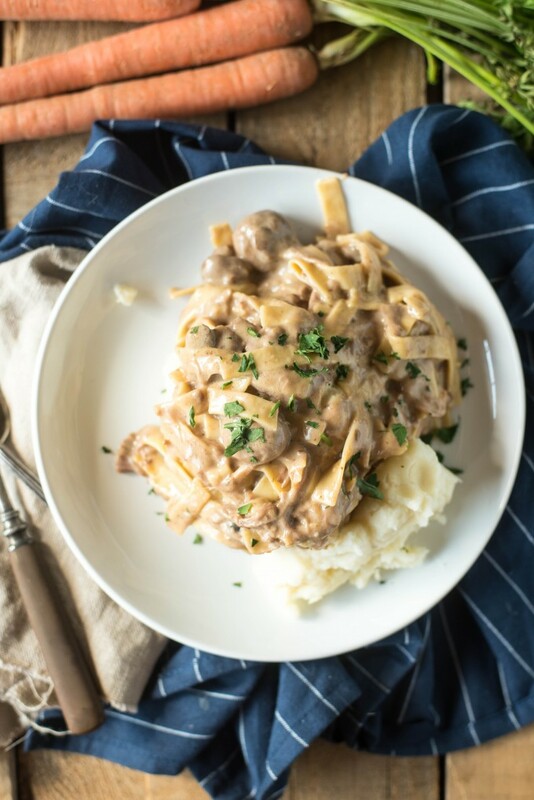 This is beef stroganoff without the sour cream. Is this really salty? Also, it is not diabetic friendly since both the noodles and potatoes are carbs. Thanks for the info! Like I said, I have no knowledge of the diabetic diet, so I wasn’t comfortable answering in any capacity! No, it is not really salty, especially when served over mashed potatoes- they sort of balance each other out, just like when you serve gravy over them. If you are concerned with the salt, use low sodium cream of mushroom and sub the consommé for a no salt beef broth or stock. You can always add more cream/milk at the end to adjust as well. I am not a salt fiend by any stretch, and I love it! Its pretty salty. When I make it I don’t salt the meat or add any extra salt and it works out fine. I live in PA dutch country.I grew up eating noodles cooked in the roast beef broths.Very simple and dull for me. I like a little pizazz to noodles. This soundss just perfect for me and hubby, any thing with mushrooms is a hit with him. Can’t wait to try it. I live in Europe, what is “au jus mix please? I noticed it calls for 14 oz. cans of consommé & cream of mushroom soup, but we don’t have those size cans here. Soup comes in 10.5 oz. (regular) or 26 oz. (family size) cans here. Is this a mistake in the recipe or is Texas out of touch with the rest of the country on can sizes? So which size is it? 10.5 or 26? It’s the 10.5 oz can. It’s just an honest mistake on her part. Lighten up, say thank you for sharing and try it or not. You can always try a different recipe or make one up yourself. No reason to be rude to others. She didn’t have to share. I started this recipe and it is cooking on low then found out we are going out to dinner tonight. Can I refrigerate and resume cooking tomorrow with the noodles and cream? I’m assuming my answer is no longer pertinent, but yes, that should be fine! Made this for my family in a pressure cooker Xl. Turned out delicious. one hour for the meat, another 15 min. after adding the noodles. Served over red mashed potatoes. Yum. Thanks for the quick dinner idea. My son doesn’t like mushrooms. Can I leave out the mushrooms and change the cream of mushroom soup to cream of chicken? I have one kid that likes mushrooms and the other doesn’t. The one that doesn’t just leaves the mushrooms behind when he is eating, and I’ve never gotten a complaint about the sauce. I personally don’t think Cream of Mushroom soup actually tastes like mushrooms. I leave out the mushrooms and use cream of oinon. It’s excellent! If I wanted to add sour cream to this, how much and would this make too thin? I’m not sure, probably personal preference. I always start with 1/2 cup of something different and work my way up. We tried this minus the noodles because I kept forgetting them on my grocery list. Excellent. The whole family liked it! Would I be able to cook on high? Sure, just cut your time in half probably. Are these the dry egg noodles from the pasta aisle? Or the frozen ones (one brand is Grandma’s)? They are dry egg noodes- the flat, narrow ones. Can you use fresh mushrooms? Sorry, but I am kinda brat and prefer fresh over canned. Don’t know why you couldn’t, but I’ve never used fresh mushrooms in the slow cooker. Let me know! Come on….this is just full of sodium…. (everything comes from a can) duh…read the labels..
No one is forcing you to make it. Did leaving this comment make you feel extra warm and fuzzy inside? I’m going to give it a try. Did we decide which side soup can? And would it be just as good eliminating one of the carbs? How about using gluten free noodles? How do they do in the microwave? Your option to eliminate a carb if you’d like, but I love it with both! Just the regular size soup cans. Nothing special, I think I went back and changed it in the ingredient list. I’ve never used gluten free noodles so I cant help you there. Loved the idea of this so I cooked in my crockpot overnight. My husband couldn’t wait till morning, said he could smell it all night. Lol. In the morning I added the milk as I didn’t have cream and it was Soooo salty! Followed the directions exactly, even added hot water to the mix to thin out the gravy some and it was still too salty to eat. Any suggestions would be helpful. Are you eating it on its own, or over mashed potatoes? 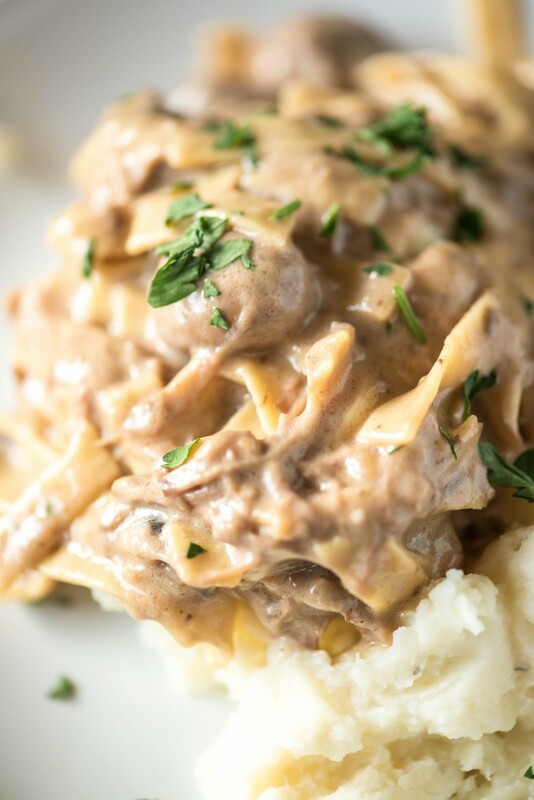 The beef mixture is salty so that when you put it over mashed potatoes, it doesnt taste bland. If you want to eat it on its own, I would suggest using low-sodium cream of mushroom soup. Just what I was craving, easy and delicious. This was delicious! Ate it with a side salad. My husband went back for thirds! I will definitely be making this again. Thanks so much for this! Instructions don’t indicate draining the mushrooms, but watching the video, it appears there is no liquid added, am I correct? We have an Amish town nearby in Plain City, Ohio. One of the restaurants there makes this and it is delicious. I wonder if the chefs get questions about diabetes, carbs, salt, etc. I guess being a good chef isn’t enough these days. You need to be a doctor as well. Although all bloggers get trolled, I never see any stand up to them as you did. That was awesome! Thanks Carol! You made my day. Sometimes I let it go and sometimes I just need to let people know that they are entitled and sort of awful! I do drain my mushrooms. I loved this recipe-with the noodles and the mashed potatoes! Didn’t add any extra salt-the canned soup is salty enough. Had difficulty printing out the recipe though. I had to copy and paste it because the bars at the left side kept covering up part of the recipe. — The ones that have 20K, facebook,twitter etc. Couldn’t get rid of them. I can’t seem to find any Canned mushrooms where I am at. (everywhere is out argh!) 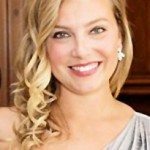 Could I sautee the Mushrooms seperate, then add it to the crockpot? I had this recipe bookmarked for months and finally made it. I’m so glad I did! It was the perfect meal for a snow day. I didn’t read any of the comments ahead of time and didn’t use low-sodium soups or broths, so I did find it a little salty. But, that’s my fault for not reading your suggestions! Will make many more times. Thanks!